What Is the Dying Behavior of Cats? It's a good idea to be aware of the symptoms of the feline leukemia virus and discuss your concerns with your vet. From visible signs like weight loss and enlarged lymph nodes to more subtle indications like weakness and lethargy, this deadly disease makes it presence known in a variety of ways depending on the stage of the illness. 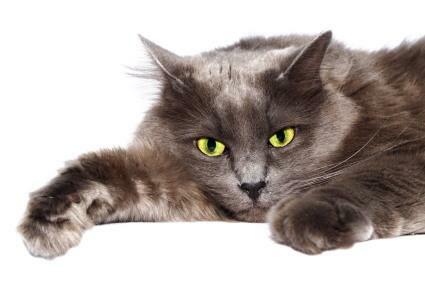 How Long Can a Cat Live With Feline Leukemia? Like many humans with auto-immune disorders, cats with feline leukemia will have periods of good health followed by periods of difficulty. Since there is no cure, it is important to keep your pet as comfortable as possible. Talk to your vet about pain management techniques to keep your cat comfortable. The symptoms of FeLV in pregnant cats are identical to the above. A queen may not carry her litter to term and may experience either disintegration of the fetus or spontaneous abortion. What this means is that in a multi-cat household, the normal hissing, grooming or shared water bowls may all contribute to the transmission of the disease. Shared litter boxes and food bowls will carry the virus from one cat to another as well. How is FeLV Diagnosed and Treated? Unfortunately, there is no real treatment for this disease. All medications are aimed at making your pet as comfortable as possible and relieving pain and anxiety. Your vet will prescribe antibiotics to handle any secondary infections caused by the FeLV. 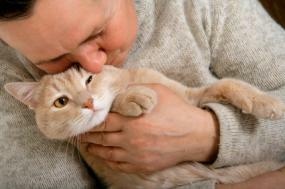 He or she may also schedule chemotherapy if your pet is suffering from a cancerous form of the disease. Mainly, your will monitor your cat's health for changes from week to week. Since inside cats are at less risk than outside cats, consider keeping your cat in the safety of your home. Vaccinations are available for FeLV. While not one hundred percent effective, they are helpful. Watch your cat for signs of the disease, and always test new cats before they are allowed to come into your house. Keep your pet as safe as possible.